Well, I've been partly roasted again. People have sent comments, links, and opinions. I wonder if you have any idea how challenging it is to take volumes of literature and condense into user-friendly language and squeeze it into a single email? Today might be a case in point and the conclusion might be "no can do." Ages ago, I did a web site for a dentist and later for yet another dentist. So, let's start with some basic language. There are mercury-free dentists. All this means is that the dentists will not place mercury into teeth but it does not necessarily mean that the dentists are well-informed about other materials. It also does not mean that the method used to remove amalgams is safe. We all know that mercury is a liquid in a surprisingly wide temperature range but what few people realize is that it also easily volatilizes so, for example, if you share a sauna with someone with a mouthful of amalgams, that person could poison you. Worse, the vapor may condense on the wood or tile walls so that unbeknownst to the next person using the sauna, he or she will also get a mercury vapor bath. One dentist I know replaced all the drywall and cabinets in his office every 12-18 months. This is sort of like an expiry date on a cartoon of milk, isn't it? Exactly how much worse is the milk on the day after expiration than the day before it? In the past, I mentioned that Sweden is so serious about mercury that amalgams must be removed before cremation of a corpse. This is really a wise decision so invasive as it might feel to the beloveds left behind, it is the environmentally correct procedure. Norway has banned all use of mercury in all manufacturing (2008). People keep asking what is so bad about mercury. I had to think about this for countless years. I told you that my Swedish grandfather was a metallurgist so the family understood the dangers of toxic metals, but my mother didn't protect me from them though she herself had no amalgams. I have had occasion to question many things about growing up and all of us are well advised to question our parents, teachers, health care providers, and government! It seems money can buy just about anything, including bad science. We read about neurological problems and breakdown of the immune system due to mercury, but exactly how does this actually happen? One of the dentists who presented at a seminar on Oral Toxicology was also a microscopist. He referred to mercury cations and pointed them out in darkfield. What I observed is that these objects have a variable number of highly mobile dots inside. 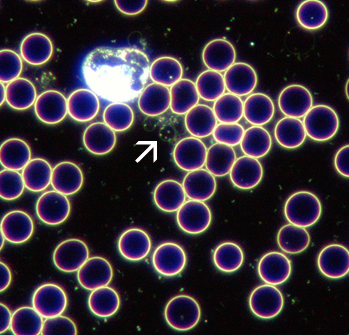 The dots are also of several different colors and white blood cells attack them. 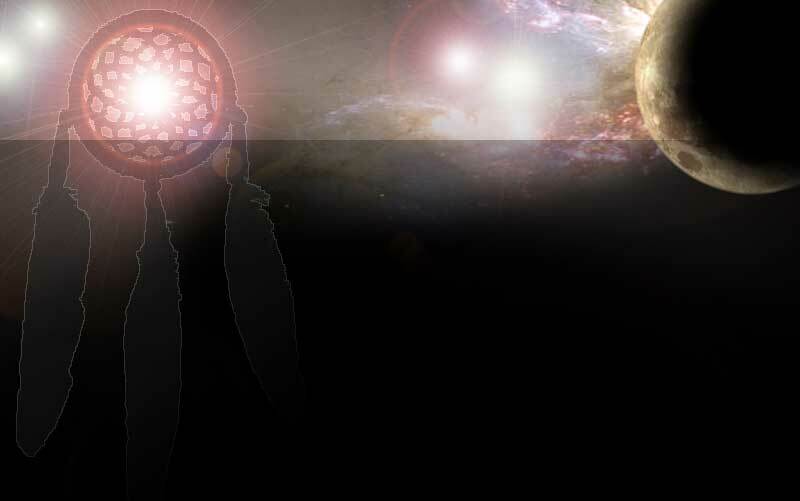 I asked a graphic artist to take one of my images from darkfield and color it in PhotoShop to make it easier for untrained eyes to understand. I know how much you hate attachments, but I don't think I can tell this story without pictures. I put a flash presentation online years ago, but very few people understood what they were seeing. This is a shot from a patient who had very serious and incapacitating lymphedema and a mouth full of amalgams. This is scenario is very typical of patients with amalgams. The entire resources of the immune system are devoted to a suicidal assault on these objects that have various names. I would like to speculate that they are free radicals or somehow associated with free radical behavior and that they are inorganic, not bacterial. If I am right, a great deal of medical theory would have to be revised and you can imagine how long that might take. So, what do you actually see here. You see red blood cells, not badly formed at all. In fact, everything looks fairly normal. These is room for improvement, but the main clue is that the white blood cells are on a mission, far too many in one place. Now that you see what is what, watch the flash. 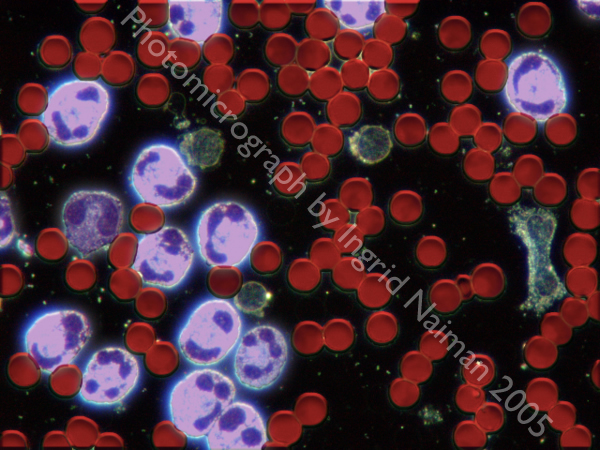 Right in the middle of the first flash image, you see one of these "objects", much smaller than a red blood cell. Initially, there is only one white blood cell near the "object". The reinforcements come to help out. On the second slide, the white blood cells have started to disintegrate so many of them do not look like the picture above. This cell death takes about 15 minutes and within 45 minutes, all the original white blood cells will have died and more reinforcements will have arrived from other parts of the sample. This goes on day in and day out until the underlying problem is resolved. The plasma is full of debris and there is zero possibility that the white blood cells will prevail against their targets. Some people are afraid to chelate, but if the chelation is done very, very carefully, this problem can often be solved within a week. The danger is that some people will be reckless and mobilize mercury from their amalgams or they will mobilize mercury faster than they can eliminate it. For years, I have been trying to explain that for all intents and purposes, there is no reliable immune system if there are toxins in the plasma that destroy white blood cells. Those toxins can be free radicals due to metal toxicity, chemicals and drugs, radiation toxicity, pH imbalance, or fungi and their mycotoxins. There are people for whom this is a serious and life-threatening problem and people who will appear to handle the dangers better than others. The reason for studying live blood is to find out who has which challenges to overcome in order to be well. As mentioned, amalgams leach. There are few studies that address this subject accurately. The first I saw was performed on sheep. In their case, the amalgams were 49-53% mercury when placed in the tooth and 9-13% when removed six months later. In humans, the rate must vary according to location on the tooth, diet, and many more factors, but the point is that within a period of time after being placed in the tooth, much of the mercury has gone missing. The theory is that most of the mercury is accumulated in the kidneys but in actuality, it can be found in almost any tissue. In addition to mercury-free dentists, there are biological dentists who have committed to recognizing the differences between products available for use in dentistry and they are trained to do their utmost to avoid harm to the patient by using the highest level of safety and checking of biocompatibility of materials.